Sometimes you just need to email one parent, but sometimes you want to email all your students parents or one class period's parents. 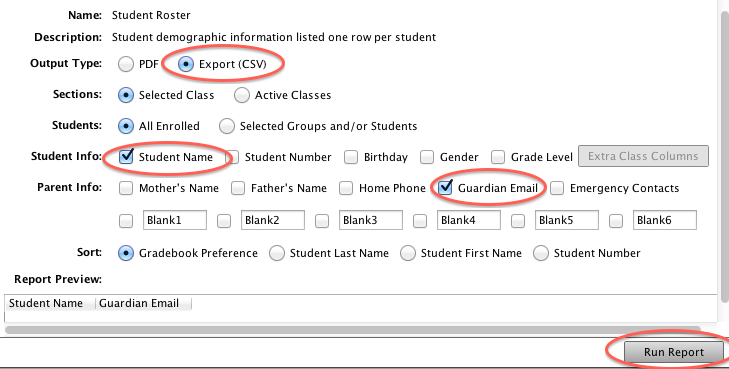 The following instructions will help you create a spreadsheet with all parent email addresses. You can save and use the Excel spreadsheets that are created, but I prefer to copy each class into one Google Spreadsheet. Notice that some students have multiple parent email addresses. They may be separated by commas or semicolons. Gmail will allow you to copy and paste the list into the To field with commas and semicolons. Outlook will give you errors due to commas and semicolons so there is a little more work to do if you want to send emails from Outlook. You can use Split to create lists that will work in Outlook. Type =split(B3, ",") into the cell next to the first email. Split needs to know what you are trying to split; in this case it is cell B3. Then it needs to know what you are using to indicate where it should separate; in this case a comma. Then you can drag that formula down the list by dragging on the little blue box on the bottom corner of the cell with the formula. Now you can copy and paste the cells containing the separated emails into the To box of an Outlook email.